T-ara releases music video for 'Cry Cry' and made it into Youtube homepage! like 'Lies' and 'Good Person'! 510,730 views!By the way, let's make the view become 1million views! This is our very first time we're going to trend something at Twitter. It is Black Eyes !!! Help us trend Black Eyes WITHOUT HASHTAG! So trend Black Eyes 18.11.2011 ( Friday woohoo~ ) started at 12AM ( GMT +9) / Korean time. Go sign up for twitter.com and follow us for more updates! Please participate this project ! We must get to TOP 5 of trending MALAYSIA! I hope you guys will help us trend for this project~ ~ That's all! ALL THE BEST! Girl group T-ara will be making a comeback on November 18th through KBS 2TV ‘Music Bank‘! Originally, the girls’ comeback date was set to be on November 25th, but the wait has been shortened to November 18th. 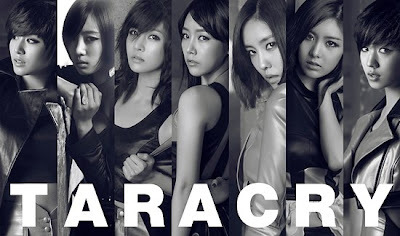 T-ara will return to the stage with their new track, “Cry Cry“. The label company also shared that T-ara will be throwing away their cute side, shown in “Roly Poly” and will be revealing a new concept that is much more charismatic and tough. Check out the teaser for “Cry Cry” below. Girl group T-ara will join the rush of comebacks in November with a comeback on the November 18th episode of KBS 2TV "Music Bank". They will also release their brand new mini album "Black Eyes" on the 18th, instead of the original date of the 25th. In addition to that, they will show two completely different sides of them with "Cry Cry" and "lovey-dovey". Originally they were going to promote them at the same time, but have made a last minute final decision to promote "lovey-dovey" a month later starting on December 3rd because of their two incredibly distinct concepts. Hyomin's 11-character abs have also attracted attention from the "Cry Cry" concept photos released. She has been preparing to showcase her 11-character abs by training for it over 100 days which she previously revealed through her Twitter. T-ara showed a cute side of them with their retro hit "Roly-Poly", but will show a tough and charismatic charming side of them with "Cry Cry".